When planning a romantic dinner, be sure to have candles, incense, and aphrodisiac recipes at the ready. From the time of ancient Greece, certain foods have been associated with Aphrodite, the goddess of love. These foods are said to inspire ardor, passion, and romantic feelings. While there is no one food that will guarantee arousal, there are some foods that can help create a romantic setting. These foods are often found in aphrodisiac recipes. Chocolate has long been considered an aphrodisiac. This could be because it tastes so good or it could be because chocolate helps increase the serotonin level in your brain, which makes you feel good. If you are looking to get as much chocolate as possible in a single bite, you might want to make some truffles. Truffles can be flavored with anything from lavender to champagne and can be made several days beforehand. Another food that has been considered an aphrodisiac is the mango. This recipe combines mangos and chocolate for a double dose of aphrodisiac goodness. Peel and dice the mangos. Evenly divide the mangos between 6 Brûlée dishes. Set the Brûlée dishes on a cookie sheet. Mix the cream, crème fraîche, vanilla pod, and seeds in a heatproof bowl. Heat the mixture over the simmering water for at least ten minutes. Remove the vanilla pods and add the bittersweet chocolate. In another heat-proof bowl, whisk the eggs and honey. Slowly add the chocolate cream while whisking. Place the bowl over the simmering water and stir until thickened. When the custard coats the back of a spoon, it's ready. Remove from the heat and pour the custard over the mango in the Brûlée dishes. Let come to room temperature and refrigerate for at least 6 hours. 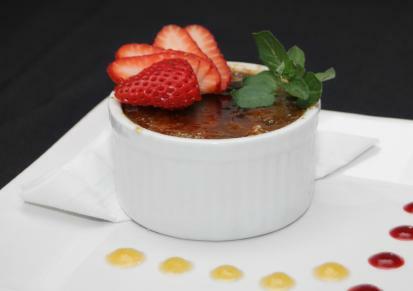 Sprinkle the tops of each Brûlée with the turbinado sugar. Broil briefly as close to the heat as possible until the sugar is melted and caramelized. Since strawberries are considered to be an aphrodisiac, you can melt some chocolate and dip some cleaned and dried strawberries into melted chocolate. You can use these as a garnish for your chocolate mango Brûlée. Almonds have from time to time been thought of as an aphrodisiac. While a bowl of roasted almonds might not be looked upon as romantic, almonds do show up in many aphrodisiac recipes. This recipe combines chocolate and marzipan into a decadent cookie. The rich chocolate cookie wrapped around a center of tender almond paste is a sensual delight that is sure to arouse passionate reactions. In your stand mixer, mix together the butter and sugar until light and fluffy. Mix the flour and the cocoa powder. Add the flour to the butter mixture and mix until just incorporated. Turn the dough out onto your work surface. Cut the dough in half and wrap one half tightly in plastic wrap. Roll out, using a very light touch, the remaining half of the dough to ¼ inch thick. Using a 2-inch round cutter, cut out as many rounds as you can. You should get about 36 rounds. You will have to re-roll the dough at least once. Place the rounds on the cookie sheets. Cut the marzipan paste into 36 pieces and place one piece of marzipan on each round. Roll out the remaining dough and cut out enough rounds to cover each cookie. Place the second round on top of the marzipan and gently press the edges to seal the cookies. Pipe the melted semi-sweet chocolate onto the cooled cookies. Whatever aphrodisiacs you are serving, whether it is a nice oyster recipe or pomegranates or asparagus, you need to set the mood with more than the food. Candles, soft music, and flowers on the table help get the mind ready to be influenced by the food.